When you reach your early 40s, you may notice that the skin between your neck and jaw, which was once a taut right angle, is now simply dropping. Many people become self-conscious about the appearance of their neck. Some feel their neck looks too fleshly, or that it lacks definition. This problem is often referred to as “turkey neck or wattle” and can result from a variety of conditions – being overweight, a genetic predisposition to having a significant amount of fat in the jaw, or advanced age. The appearance of the neck can be improved by creating more definition of the angle of the jaw. Having this done can provide a boost to one’s self-confidence and self-esteem. Ultherapy is a non-surgical procedure for the face and neck that stimulates the body’s own natural healing process to lift the skin over time. 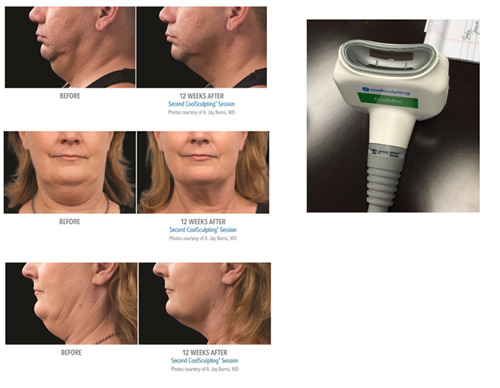 The use of FDA cleared ultrasound technology enables physicians, for the first time to see and then treat the deepest support layers of the skin typically addressed in cosmetic surgery without cutting or disrupting the surface of the skin. Read more. 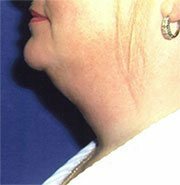 The neck lift wraps sagging muscles crosswise to the jaw to restore that all-important right angle. Compared with a facelift, sutures are smaller, there is less pulling and recovery time is much shorter. However, a neck lift has traditionally been part of a facelift and many plastic surgeons believe it should remain so. The reasoning is that, anatomically, the muscles of the neck are connected to muscles of the face, so if you try to tighten just the neck muscles, you will do your face a disservice. Using this line of reasoning, even if your big complaint is your neck, you will get better results with a facelift. If you’re confused about which procedure is right for you, have a board-certified plastic surgeon, or two, give you feedback while perusing your very own unique face and neck. The face and neck are usually treated at the same time, often in conjunction with liposuction to sculpt the area beneath the chin and jaw line. But, if you gain weight, loose skin, weaker muscles and free falling fat may contribute to your drop zone. Younger patients who have fatty necks but no significant facial aging may be treated with liposuction alone. Some plastic surgeons also might use laser or light technology to tighten necks. Now with FDA Clearance for Submental region! It has been seen that using Botox in areas where wrinkling and creases can occur will prevent deeper lines from forming and will maintain a youthful appearance. Better to not have those angry or tired lines develop, so people will not notice that you’ve had anything done. Botox can also soften those V-shaped platysma cords. Another alternative is injecting fat from the belly into the jawline area to provide extra volume. This will include the bonus of your own stem cells. Extra stem cells are separated from the fat via centrifuge and then added, making the skin glow more and enhancing collagen. Dr. Gray virtually never performs an isolated neck lift because the results of a neck lift performed by any surgeon are inevitably disappointing to patients. 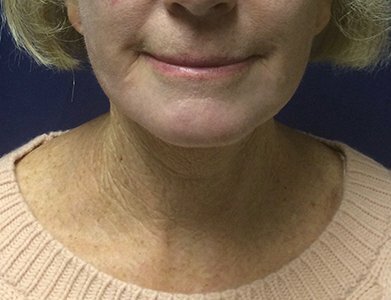 If a patient has significant looseness in the neck they always have facial laxity and jowls. If the face is not corrected along with the neck, it looks unnatural. A surprising fact is that Dr. Gray’s fees for full correction of the face and neck are the same or less than what other surgeons charge for a neck lift alone. 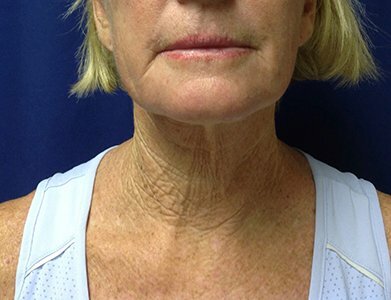 Click here to view the before and after photos of the face and neck that Dr. Gray has performed. Dr. Gray accomplishes an improved neck for the patient in various ways. First, Dr. Gray consults extensively with the patient. He makes recommendations to the patient, after which he and the patient decide together on the procedures needed to achieve the patient’s goal. Liposuction will remove excess or hanging fat from under the chin or around the neckline and neck. During liposuction, Dr. Gray will make a small incision below the chin and remove the excess fat. This procedure will take about one half an hour. Often, removing fat alone can improve problems in the neck. 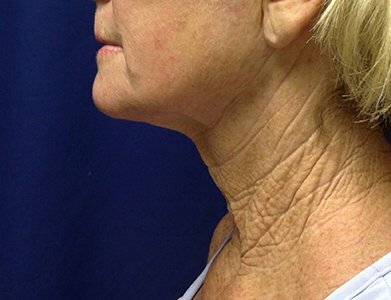 This choice is best used for patients who have little excess skin in the neck region. If they do not have excess, droopy skin, liposuction of the neck will provide a very good result. A Facelift is beneficial to those wanting to improve signs of aging on their face as well as the neck. A facelift removes excess fat and skin from the facial area, including the neck. A facelift can tighten a jaw line that has grown slack and jowly or a jaw line that has folds and fat deposits around the neck. A facelift also helps those who have no excess fat in this region, but possess a significant amount of excess skin. The correction of loose, sagging skin of the neck is best achieved by combining procedures such as facelift, mini-facelift, or lower facelift. 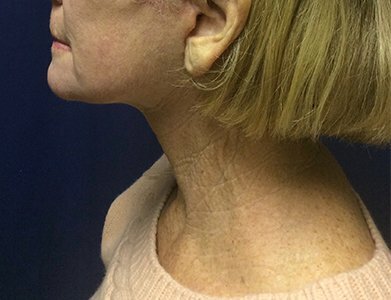 Most commonly, a neck improvement is part of a short scar or Macs facelift because it results in a better correction of the neck and is more harmonious with the face. These procedures can provide a complete facial makeover. Eyelids and eyebrows are separate procedures often combined with a facelift. With any of these techniques, the patient is usually presentable in one week. The procedures can be performed with sedation or general. Surgery takes between 30 minutes and an hour and a half. What can be improved by having a Facelift? A Facelift will remove some facial wrinkles – not all. There will be some tightening of loose skin of the neck and lower face region. What will not be helped by having a Facelift? A Facelift cannot create younger skin. You will still have some nasal labial folds present after surgery. There may be no change in the nasal labial folds. A Facelift will not improve wrinkles around the mouth. A Facelift will not improve facial asymmetry. A Facelift will not prevent the aging process from continuing after surgery. A Facelift will not change any personal or emotional problems you may have. 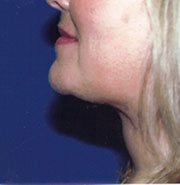 What is Dr. Gray’s goal for performing a Facelift on a patient? The goal is to make you look as good as he can for your age by repositioning the skin to the way it looked a few years ago. The surgery is performed in our state-of-the-art, certified ambulatory surgery center; this center is unparalleled in providing our patients with total privacy and excellence in care. General anesthesia or Intravenous sedation is used. The anesthesiologist and Dr. Gray and you will decide together which type of medication is right for you. How does Dr. Gray perform a Facelift? Results are achieved by surgical excision of the loose skin of the lower face and neck area. There is some tightening of the facial muscles. The results of this surgery usually lasts up to ten years (sometimes less; sometimes more).